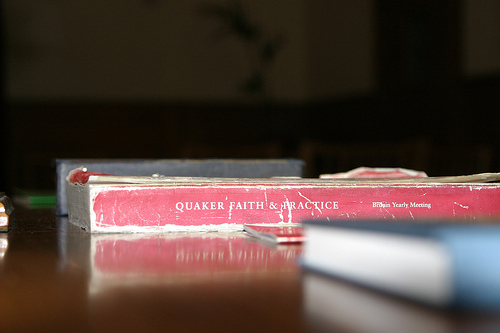 How I became a Quaker. My parents were Quakers and I was enrolled as a “birthright Friend”. They sent me to a Quaker school at aged 10, principally to avoid the blitz in 1940-41. We had daily Assembly and compulsory attendance at Meeting for Worship on Sundays. I joined a small group of pupils to be responsible as Elders of these Meetings. At 18 I registered as a conscientious objector. At 20 I started my 2 years of national service in the Friends Ambulance Unit (International service). At 23 I married Joan, also from a Quaker family and we began to be a Quaker family. At 30 I was Clerk of our local Meeting but became angry at the complacent attitude of Friends (as I saw it) and stopped attending for nearly 10 years. They were busy years bringing up a young family but gradually Joan and I had to acknowledge there was a serious gap in our lives and in the experience of our children. We rejoined with no formality and have been totally committed ever since. This is “grown up” religious practice. God is a mystery and my experience of God is real but also a mystery. The silence is the only way I can give substance to this. I have great sympathy for atheists and agnostics because the claims of Christianity are generally so fanciful and out of their experience. I don’t believe the Quakers who say they are atheists. I think they are just giving rational expression to their lack of experience of the power and love which I have received. I am happy to respond to others who ask “Are you saved?” because I am! But it saddens me that so many generous and loving Christians who start from this experience of conversion also feel the need to take every word of the gospel literally. But it also saddens me that so many Christians are hanging in there doggedly in dwindling congregations in draughty chapels unable to communicate with all the seekers after truth that surround us. There was a period in my youth when I discounted any who called themselves Christian but who were not pacifists. I am certain they are wrong, but I now feel I understand more of the struggle that many Christians have over this. My own struggle was within the Quaker community and much easier. When I stood before a tribunal of magistrates I had as witness and dear Friend who had taken me through the issues that would concern them. They knew that if she would act as witness their task would be that much easier. My life was led by God from an early age, and I was lucky to meet a girl with the same experience. Together we have been led by God for 58 years and counting. I do not know what service will yet be asked of me. It may be that I shall be required to die quietly, or nurse Joan through to her death. It may be something more dramatic. I know God will not require of me more than I can do.